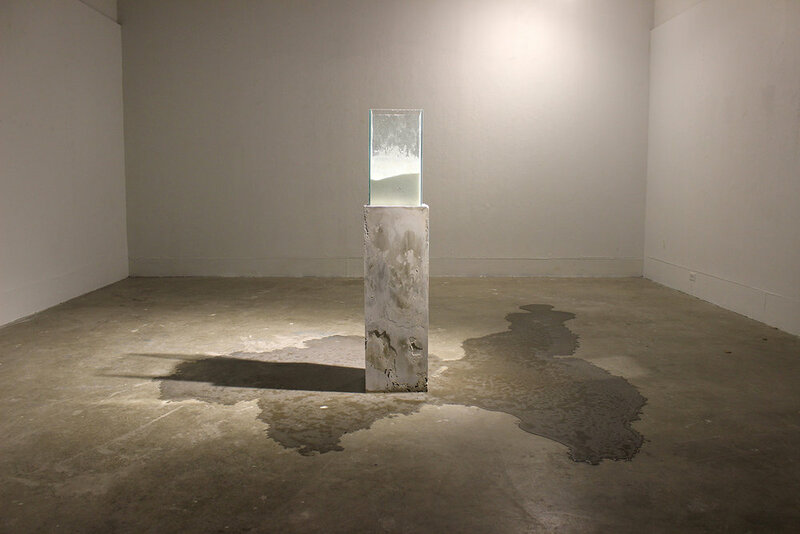 Concrete, Glass, Salt, Ice 24" x 24" x 68"
The average person filters 160 pounds of salt through their body in a year, through sweat, tears and consumption. There is a very fine line between using salt as a means of preservation and salt becoming a means of absorption. The bottom of the glass vitrine holds a block of ice to which salt creates an immediate reaction. As the salt block is slowly lowered into itself, a mixture of salt and water begins to spread to the floor. Crystals slowly grow, creating quiet, beautiful structures all while the concrete both on the floor and the pedestal began to deteriorate as the salt etches at their surfaces.